The following comments about attractions in Sarasota have been posted from individuals. We believe that the best reviews of Sarasota, Florida (FL), FL USA are written by travelers and holiday makers who have experienced Sarasota first hand and want to share their thoughts. Can you share yours? Please help us expand this section of our Sarasota World Guide. 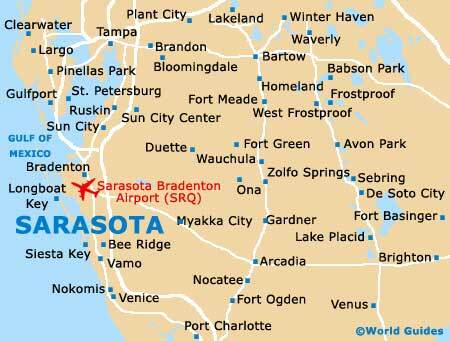 Let us know what you think about the attractions in Sarasota, Florida (FL) USA. Submit comments about Sarasota attractions here. When we got here we went to the visitor center to get some maps and leaflets and things. The staff we very nice and helpful, and I also bought some cheap postcards there. This has got to rate as one of the best museums in Florida. The Ringlings were a couple who loved art and over the years managed to get together quite an impressive collection. They left everything to the state, including their lovely seafront mansion. Apparently the tapestries by Rubens were very important. There were a lot of old religious paintings, lovely grounds and a sculpture garden. We went there on a sunny day and the sculptures were amazing. You sure can have some jungle fun here. This zoo has a lot of lush tropical plants and flowers, pathways and some animals, like flamingos, parrots and birds and some really cute prarie dogs. We had a nice meal at the Flamingo Cafe and watched a repitile show. This is part of the Mote Marine Laboratory and is in fact where they learn all about the local marine life. We learnt a lot about what was swimming around in the waters nearby. There were manatees, dolphins, sharks, turtles and all the usual kind of thing. What I enjoyed most was my creamy clam chowder in the Deep Sea Diner Restaurant - fabulous. Please note that these Sarasota, Florida (FL), FL USA comments and reviews are posted by individuals and are not necessarily the views of World Guides.